Venture Out! There’s a Place For You...Go Venture Out and Find It! Venture Out! There’s a Place For You…Venture Out and Find It! Choosing the right new community is similar to buying a car—you need to give it a good test drive. That’s why nearly all of the communities offer Discovery Packages. 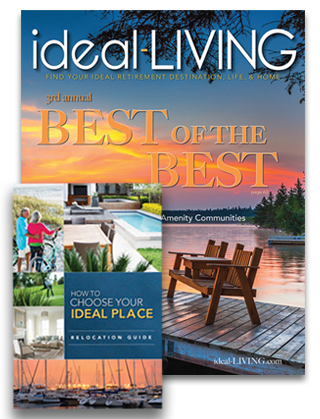 They want you to see their community for yourself and get the feel of the place that one day might be your new home, and we, at ideal-LIVING, agree completely. Simply look for your ideal community, city, or zip code of interest and ideal_LIVING will provide to you all the communities you can see within a short distance. To entice you to make that first visit, those communities offer deals that are an excellent value. They’ll arrange accommodations on-site, or at a nearby hotel. You will be able to enjoy complimentary activities like a round of golf, a visit to their spa and attend local events. Often, they’ll treat you to dinner and introduce you to current residents who can give candid answers to your questions. So here’s our best ideal-Living advice: choose an area that you think you might like—maybe one you’ve visited before or where you have friends who already live there—and set up your own “discovery tour” vacation. Pick two or three communities in the area and take advantage of the “Discovery Package” deals for a night or two at each one. Shop and compare. Visit the nearest town or city to see what it has to offer. Ask questions about the local lifestyle and imagine yourself immersed in it.